Located a 7-minute walk from Zhibek Zholy Mtero Station in Almaty, Toi-Dami Hotel offers free WiFi and free private parking. The rooms feature air conditioning, a fridge, electric kettle and flat-screen TV with satellite channels. The bathrooms provide a hairdryer, bathrobes and slippers. Guests can dine in the property’s restaurant, or eat out in the cafes and restaurants nearby. 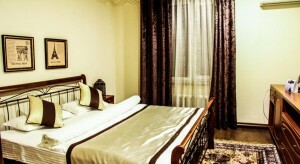 Almaty-2 Train Station is 1.1 miles away, and Almaty International Airport is 8.9 miles from Toi-Dami Hotel.